Macstock Conference and Expo and the Midwest Mac BBQ in Chicago was a HUGE hit and will definitely be repeated next year so start making plans now! Bart explains (in my voice) why you shouldn’t panic about the LastPass breach. Donald Burr tells us about the 99-cent app Reminders Nano for iPhone and Apple Watch. I renamed the Apple Store the Apple Showcase because they simply have nothing in stock any more. In Dumb Question Corner Steve Davidson asks and answers his own Dumb Question, how to stop the iPad and iPhone from making a noise if you accidentally hit the dictation microphone key on the keyboard. I tell you how the Apple Watch got me to dig up my yard and then how much fun it is to use a QFD for decision making. In Chit Chat Across the Pond, Dean Elger plays an Angry Man because of how much money I’ve cost him over the years in Apple gadgets. Hi this is Allison Sheridan of the NosillaCast Mac Podcast, hosted at Podfeet.com, a technology geek podcast with an EVER so slight Macintosh bias. Today is Tuesday June 23, 2015 and this is show number 528. Thanks for waiting for us – Steve and I just got back from Macstock Conference and Expo and the Midwest Mac BBQ in Chicago. What a COMPLETE blast. Seriously, this is going to be an ongoing gig for sure. Everyone there agreed that this was just #1 and was talking about how we should start making plans for next year. Barry Fulk, the nicest man in the world, arranged a pre-event dinner for “esteemed guests” but the bar wasn’t set too high for that moniker because they let me in. It was a great chance to catch up with the other Mac podcasters like Dave Hamilton & John F Braun of the Mac Geek Gab, Don McAllister of ScreenCasts Online, Julie Kuehl of SCIENCE SOMETHING PODCAST, Chuck Joiner of Mac Voices, and especially fun because we got to see Gary Malpaz, aka Gazmaz meet his long time co-host Guy Serle of the MyMac podcast for the very first time in person! I want to give a big shoutout to Gary Apter, aka DrDream in the live chat room for giving us a ride over and playing chauffeur. Great fun to meet him finally in person. Saturday was Macstock and it was phenomenal. I’ve never run a conference myself but it must be hard because so often these things are riddled with problems. People are trying to convince me that Mike Potter of For Mac Eyes Only had never done this before but it’s really hard to believe. With only a few months to pull it off he had a professional website, a cool logo, speakers, speaker terms and conditions, attendee registration and a great venue organized. The event itself had a healthy agenda with breaks built in so attendees to chat, fabulous audio/video support,, good and plentiful food, plenty of space to spread out and be comfortable, sponsors with cool giveaways, and even t-shirts for the attendees. It was flawless execution and I told Mike Potter he missed his calling in life! I spoke at the conference, doing a demo of Audio Hijack from Rogue Amoeba. It was fun and tricky to figure out how to do this with just the 12″ MacBook but it came through like a champ. I went from USB-C to HDMI with an adapter, then HDMI to VGA with an adapter into the projector, and audio via the built-in jack. Don had brought along the Apple digital video adapter I was unable to find locally so I tried to see if I could use that instead, because it would have allowed me to attach an external USB mic which would have been cool for demoing Audio Hijack. For some reason, even though he’d used the HDMI part of the adapter at home without a problem, when I hooked it up (along with a USB mic) we got nothing on the projector. Haven’t figured that one out yet, perhaps it has a problem doing both? After lunch we did a roundtable Mac podcaster discussion, not to be confused with the Mac Roundtable and that was really fun too. Steve got some great photos of Guy cracking up Dave, me torturing Chuck on stage – a complete blast for us. I hope the audience enjoyed it, I know we did. On Saturday afternoon we all trouped over to Barry’s house and met his saint of a wife, Bobbi Ann. She says Barry will be paying for this by taking her on an exotic tropical vacation which explains why she put up with us. The barbecue was probably my favorite part of the events for the weekend. It was a chance to meet SO many NosillaCastaways! I am sure I’ll miss someone but I want to give some shoutouts. Chris Scott?, aka CalMiKy who did the review last week of Rise and has been a great online friend came to the event bearing a Barefoot Chardonnay that looked just like the Podfeet logo. Corky Heath, aka CorkyH was hilarious – he says he feels like a stalker because he knows so much about Steve and me. I bet a lot of you might feel that way – knowing our kids name, our dog’s name, what we eat for dinner on Thursday nights, right? He kept apologizing but I tried to tell him it wasn’t creepy because I’m the one who shares all this information about myself! I’ve been chatting with Topher for a hundred years it seems so it was fantastic to get to hang out with him too. Bob Buttersworth and his adorable wife were folks I hadn’t met before but are such crazy Mac fanatics we were friends for life after the BBQ. Another favorite was to meet up again with Marie Eppleman, a long time NosillaCastaway. She is SO fascinating – she’s a professor of Industrial Engineering at the University of Michigan and told us about how she works the algorithms behind beam forming in radiation therapy. Kirschen would have LOVED talking to her! We met Mike LaPlant who does the EyeChart Radio podcast with Ken Ray which was super cool. Marie O’Brien who works for Apple seemed really keen on getting together to do some interesting stuff in the future – she seemed to want to pick my brains and I hope she does! Matt Hillyer made it over and we did some fun heckling during Macstock together. Martijn came all the way from the Netherlands to bring some GoodPony to the whole event. Chris Kanazawa gave me a SUPER hard time for costing him a lot of money because of all the gadgets I make him buy AND the amount of time he spends listening to podcasts because now he listens to the SMR Podcast too. I loved that. 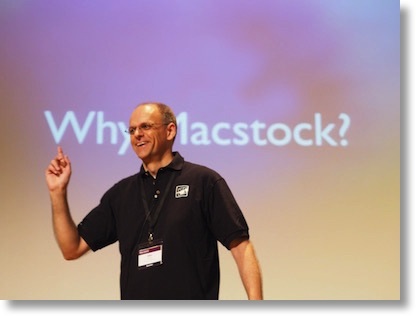 Luis, aka Powerbook540 tweeted a photo out from Macstock but we hadn’t met yet so I didn’t know what he looked like. When we were at lunch I simply hollered out, “LUIS!! !” He whipped around with alarm and came running over thinking he did something wrong! We had a good laugh about that but it was an effective way to find someone! 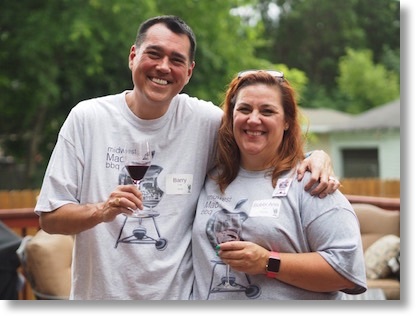 Another very long time NosillaCastaway, Brett Canedy, aka bcanedy, made it to all of the events and it was fantastic to connect with him. If you haven’t been where Leon Sargent is holding court and regaling his audience with tales of adventure, you simply haven’t lived! And finally Dan Schmidt was kind enough to drive us back from the barbecue and we got to hang with him a bunch there too so that was awesome. I loved talking to Mark Fawcett and Jodie Spangler and Steven Capps and Thomas Piper and David Dykstal and oh gosh I’m sure I’m going to forget someone and I’m so sorry if I did but I’d better stop somewhere! I took a bunch of photos with the spectacular 90mm f/1.8 Olympus lens and posted them all in Google Photos and put links in the show notes to the three albums so you can see who all these people are and get a better feel for the event. I have to give one final shout out to Dean and Suzanne. Dean is an avid listener, and they put us up in their home for three days surrounding the events. we’ve known them for a dozen years and it was fantastic to get to geek out with them in their home and eat too much and tour Chicago! You’re going to hear from Dean later in the show as he’s my guest on Chit Chat Across the Pond. Many thanks to all for making this a very memorable event and we can’t wait till we do it again next year! The LastPass Breach – Don’t Panic! When the iPad came out, people complained that it was missing some default apps that normally come with the iPhone (Stocks and Weather) Similarly when the Apple Watch came out, people complained that it lacked a Reminders app. Particularly curious since you could create them using Siri, but there was no way of viewing them or marking them as completed. Enter the 99-cent app “Reminders Nano”. This app for the iPhone gives you a basic no-frills view of your Reminders. But the real point of this app is the Apple Watch portion of the app. It basically adds an interface for viewing reminders and marking them as completed. You need to run app at least once on your iPhone, so that you can grant it access to your reminders. You’ll get a list of your reminder lists. Force touch will let you create a new list. Tapping on a list will show the reminders in that list. If a reminder is time based it will show the time. There is also a dedicated list for “Scheduled reminders” that you can get to from the main screen. Each reminder is shown along with a little circle next to it. Tapping on the circle will check off that reminder. Force Touching will allow you to create a new reminder, or to show or hide completed reminders. Useful to see what reminders you’ve completed, or if you accidentally marked one as complete that you didn’t mean to. Also check out otakunopodcast.com if you’re at all curious about Japanese anime (animation), manga (comics), food, travel, culture, etc. Summer con season is starting, and the US’s biggest anime con, Anime Expo, is coming up in less than a month. And we’ll be there! I often type on my iPad in semi-public situations, like taking notes in meetings. One advantage of the iPad is that it is (normally) a lot quieter than a computer keyboard, Unfortunately, the proximity of the voice dictation (“microphone”) key to both the number (“. ?123”) key and space bar means that I bump it more often than I would care to admit. There were two ways of dealing with this: turning off the dictation capability in Settings (unacceptable since I use it from time to time), and finding a way of muting the tone (while I’m typing, the visual indication is good enough for me) — and the latter was my quest. Muting sound (which, on the iPad Air 2 is controlled via the Control Center, whereas on older models done with the physical switch) doesn’t work. That would have been too easy. Evoking Do Not Disturb mode doesn’t do it either. I was stumped. I was in the process of writing it up as a Dumb Question when I decided to do a search on “how to temporarily disable siri key on keyboard,” and the answer was actually out there (although it took some digging). Apparently, the dictation feature has its own volume control, so the only way to silence it was go get it into “listening mode” and then repeatedly hit the volume-down button until it is minimized. This setting seems to stick — and solves the problem. So I offer this Dumb Question — and Answer to my fellow Castaways and hope others find it useful. It occurred to me that since we have a lot of new listeners all of the time, it’s probably time I step back and explain what Clarify is, instead of just launching into one of my examples of how I use it. Clarify is an OS X application designed to help you create tutorials on how to do something. As simple as that sounds, most people use ill-suited tools to do this, like Microsoft Word or worse yet PowerPoint. Clarify is designed for the task. It has a built in screenshot tool that drops the images into separate steps, and then you can go into the tutorial document and add annotations like arrows, boxes and text. You can blur out sensitive information and highlight other information. You can put sequence numbers on the image and add corresponding text that will float perfectly with the image in the final product. You can post the tutorial online at the free Clarify-it.com site in a special area just for you, you can send it as a PDF, and you can even post it to your website with a click of a button. Clarify is $30 in the Mac App Store, or you can start with a free trial from their website at clarify-it.com. They even make Clarify for Mac and Windows and you can get a cross-platform license if you’re of the slider persuasion. If you buy it, be sure to tell them you heard about it here! In this segment Dean from Chicago joins us to tell him why he’s so angry at me. Basically he blames me for causing him to spend so much money over the years buying Apple gear. I have to admit, before we left Dean’s house, I also made him buy AppDelete from Reggie Ashworth, the movie Dodgeball, a bigger backup drive for Suzanne, and 1Password! That’s going to wind this up for this week, many thanks to our sponsor for helping to pay the bills, the makers of Clarify over at clarify-it.com. Don’t forget to send in your Dumb Questions, comments and suggestions by emailing me at allison@podfeet.com, follow me on twitter @podfeet. Check out the NosillaCast Google Plus Community too – lots of fun over there! If you want to join in the fun of the live show, head on over to podfeet.com/live on Sunday nights at 5pm Pacific Time and join the friendly and enthusiastic NosillaCastaways. Thanks for listening, and stay subscribed. Here’s my solution on how to temporarily mute your iPad. Get a crappy old pair of headphones/earbuds/whatever. They don’t have to be anything special, you can even buy one of those $5 pairs of crap headphones you see in drugstores. Now Chop off the plug end of it. Whenever you want to type discreetly, just plug it into the iPad’s (or iPhone’s) headphone port. As long as the headphone plug has *something* plugged into it, the iPad will disable the built-in speaker (and thus not play the voice input tone when you accidentally tap the dictation button.) And the chopped-off plug end of the headphone cord is small enough that I can easily stuff it into my wallet so I will always have it with me. The “turn Siri volume down” method that the person mentioned (I don’t believe he or you ever gave his nam) is handy, but having to hold that volume button down to mute Siri (and then un-mute it later) every time you go into a meeting or want to type discreetly is kind of a pain. I don’t think you understood the instructions, Donald. Open up an app where you can type, then hit the dictation microphone. While it’s in that listening mode, turn the volume down. The ONLY thing that gets muted is the noise the mic makes when you tap it. Your audio is still independently controlled for playing movies, etc, This is a do it once and forget it maneuver.